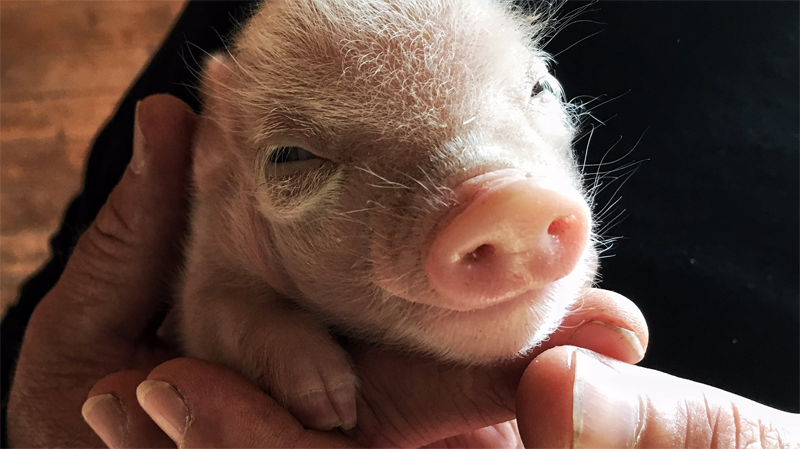 An unexpected litter of five adorable piglets is putting financial pressure on a Metro Vancouver animal sanctuary. The piglets' mother, Lulu, and another pot-bellied pig were seized in a BC SPCA cruelty investigation then delivered to the Happy Herd Farm Sanctuary in Aldergrove in June. "They had been abused," said Happy Herd co-founder Diane Marsh. "You could not get near them. They screamed at people." The pigs eventually warmed up and settled into their new life, but last week Lulu delivered a surprise. "We were told there was no chance they'd be pregnant. Well, last Thursday night, somewhere in the middle of the night, Lulu gave birth," Marsh said. Making matters worse, the mother suffered birthing complications that required she undergo serious surgery and treatment for life-threatening sepsis. She's recovering now but the runt of her litter, Garth, is under round-the-clock care; while his siblings have already more than doubled in size, tiny Garth has only gained half a pound onto his already-tiny frame. "He wins everybody's heart. It's up and down, it's a daily fight with him," Marsh said. Beyond the pricy vet bills, Happy Herd said the five unexpected guests are going to create a number of unforeseen costs, including new winter shelters where the pigs can stay once they're fully grown. Marsh and her partner, Stephen Wiltshire, are now asking for donations to help continue caring for the animals, especially since they have no information on who sired the piglets. They suspect it could be a large, commercial hog. "[As a result,] we're not sure how big these pigs are going to be. They could be 100 lbs., they could be 800 lbs. Some of the big farm pigs are massive," co-founder Stephen Wiltshire said. "As they get bigger I think we're going to need to reinforce a lot of our fencing, just because of the size." The sanctuary, which depends on volunteers to operate, was already caring for around dozens of animals, including chickens, ducks, roosters, turkeys, sheep, cows, goats and a donkey before the piglets arrived. To volunteer with Happy Herd or learn more about donating, visit the sanctuary's website. The runt of the litter, Garth, is so tiny that Happy Herd Farm Sanctuary worries he could be carried away by a large rat.